Here we are, at my favourite time of the month when I and many others check and update our portfolio and analyse how closer (or further) we are getting from our dreamed goals. 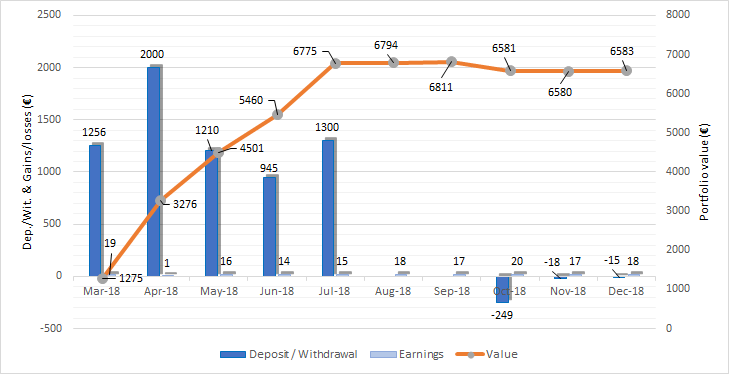 In spite of this being my second portfolio update, it’s my first one as a full month since I started this blog, which still makes it very exciting, as I can compare results with the previous month. I’ve been running a bit crazy this month. Blogging is a completely new experience to me, and it takes some time to learn how this whole thing works, and how to schedule my time to read other blogs, while also keeping this one alive. This blog is still quite in a development phase and it may change in the future, once I feel more comfortable with new ideas after the initial learning curve. It has been a little nuts at work too, the majority of our customers want their products designed and manufactured prior to the end of March. I’m wondering if that’s got something to do with Brexit and whether this workload trend will continue after March or not. Exciting months coming up/down here in The UK guys! Other than that, nothing much has been going on these last four weeks, rather than keeping myself warm at home, discovering such a great people with amazing content in their blog sites and spending some awesome time with my girlfriend, who sometimes complains about me spending so much time doing the first instead of the second, hehe. I promise to improve the second one in February ;). Let’s get to the main stuff, the numbers! January has been a much better month than December was. 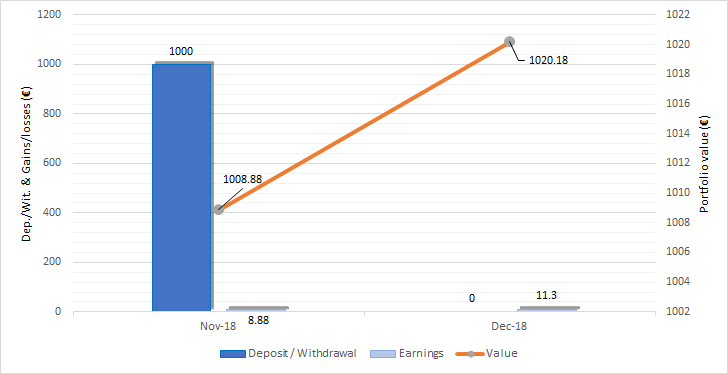 My favourite Index, the S&P 500 rallied a few points, propelling my Vanguard ISA account above my previous 0.04% return, bonds funds paid its average interest, pound gained value against the euro, my crowdfunding sites performed well, as usual, and finally my algotrading account made a nice jump too, gorgeous! As usual, the platform that has generated more money this month is Algotechs, followed by Vanguard and Grupeer. The Pound Sterling value against the Euro has increased a little bit, from a 1.11 ratio at the beginning of the month to a 1.15 (£1=1.15€). That’s good news for me, as I own some Pounds but make the numbers in Euros. I am very curious to see what’s going to happen to this ratio in the next couple of months, it adds some excitement I must say! 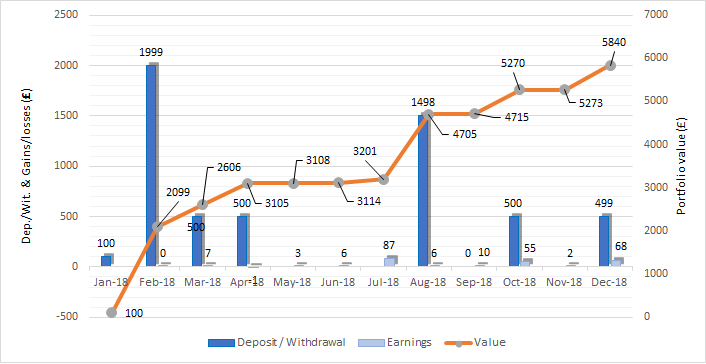 My algotrading account increased by 13,431€ this month. This is the best month I’ve ever had with Algotechs. It was quite scary, to be honest! The drawdown was high during these last days, on Brexit news and federal reserves’ meeting on Wednesday, having open positions with an accumulated negative value of -17.000€, at certain times (see mobile phone screenshot down below). The % drawdown is not high generally with this ATS software, so I panicked a little bit (a lot actually!) and reached to my account manager, who calmed me down and told me that everything was under control. He was right, soon after the conversation, the application began closing positions at values between 400-2000 €, phew! Could you image to deal personally with such a huge trades? I would completely lose my nerves, and end up as most Forex traders do – losing money. Federal Reserve decision on leaving interest rates unchanged and the better than many expected results of Apple and Facebook sales fueled US markets. Both news are very positive for my S&P 500 ETF held in my Vanguard portfolio. Will Apple rally like an rocket overcoming Amazon market capitalitzation and get back up to the top as it once was? (according some analysts), I opt to follow the opposite and buy Bonds, to keep my Stocks/Bonds ratio balanced, that’s similar to what some would call ‘contrarian investing’ – buy when masses sell, sell when masses buy. unconsciously permanently) in The UK and building my free-tax ‘British empire’ account. More on this soon. To conclude with, my account returned £628, from which £87 are passive income from my S&P 500 and bond ETFs. Regarding the S&P 500 Index, the increase has seen a nearly 10% upwards move against 2.4% in my ISA account. The two indicators down below on the picture are the MACD and Stochastics, both show that the Index is overvalued. My guess (and it’s only my guess!) is that the price will correct slightly and bounce back up again after the positive recent news (if no worse news surge) topping at the 3000 resistance level. These are just assumptions and don’t affect my investment decisions, but I just love the fun of whether I will be right or not. Earnings from Property Partner were lower than usual for this month. Even though having a record rental income, I had to pay the purchase fee for the last property acquisition, leaving total net earnings of 7£ in January. After this acquisition, my forecasted monthly rental income increased to £19.41. This should raise a bit higher by an approximate value of £27, after the purchase completition the other two properties that are being processed with expectations to be completed shortly. We only had one new opportunity in January and it is only available for High Net Worth or Sophisticated investors. They have raised more than £1.6m so far. If even the ‘Pro’ investors (those that know what they are doing and not me) use Property Partner, maybe for a reason. I am not a pro yet, so retail investors will have to wait a bit longer until the next opportunity comes. Property Partner recently introduced “Innovative Finance ISA”. This could be good news for Property lovers with UK residence. Personaly, I prefer to keep my ISA with Vanguard. If you feel like interested in Property Partner, you could check what property shares I own and how much cash flow they are giving me on this page. 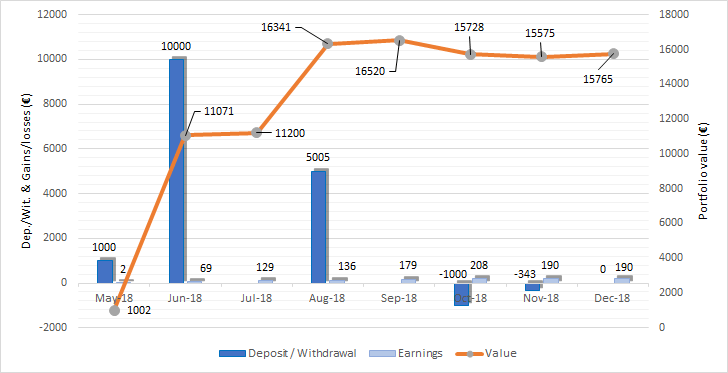 I also wrote a review after one year of investing, where I share my personal opinion and results. Hope it adds some value to you. Income from Housers climed slightly in January. As I said in my previous portfolio update, part of my invested funds are located in buy-to-sell opportunities. One of this propertites was sold in December, three months earlier than expected, returning the principal payment plus interest to investors this month. 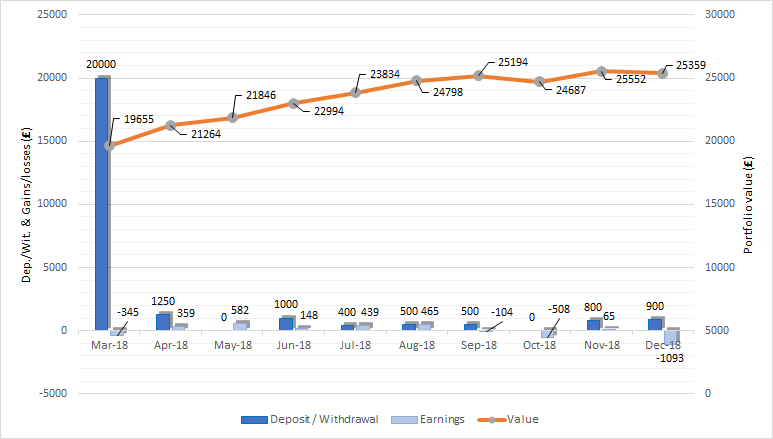 I invested 130€ back in April and returned me 6.92€ gross interest. That is a 5.3% (7.95% AER) return in 8 months VS the promised 7.1% AER. I was looking forward to exiting the first project to personally verify that the rates promised are somehow similar to the ones delivered and so has been in this case. I was able to sell 50 more Estadio Nacional shares but still have 100 more to go that no one seems to be in a rush to buy. I reinvested the money returned from the exited project and Estadio Nacional shares in newer development loan opportunities, averaging 8-9% interest rate. I expect around 20€ of earning next month after this move, hoping to boost the returns rate. €, which I withdrew thereafter for diversification purposes. I’ve got not much to complain about Grupeer, being still one of my favourite platforms, except for their website. I find it complex to track my investments in detail. For instance, I never know whether interests are paid on time or what my annual net return is. It doesn’t extremely bother me, because the numbers work out at the end of the month, but these little things should be taken into account if they want to expand further. Two loans will reach maturity date early in February, that should cash me in another 2200€, which I will also diversify to somewhere else. I plan to keep withdrawing until I reach an approximate value of 10k in my Grupeer account. An account manager was appointed to me ready to answer any questions I may have, thanks for this professional approach. I deposited 1000€ in Mintos. My weighted average interest rate is improving, but its also becoming riskier, as the newer loans I invest in have a B and B- rating with a higher defaulting risk. Although they all come with buyback guarantee, I am not completly sure if it is worth the risk after seeing the number of loans defaulting is accelerating month by month. More than 500€ were bought back, meaning that 24% of my invested funds are being lended to someone who can’t pay back. 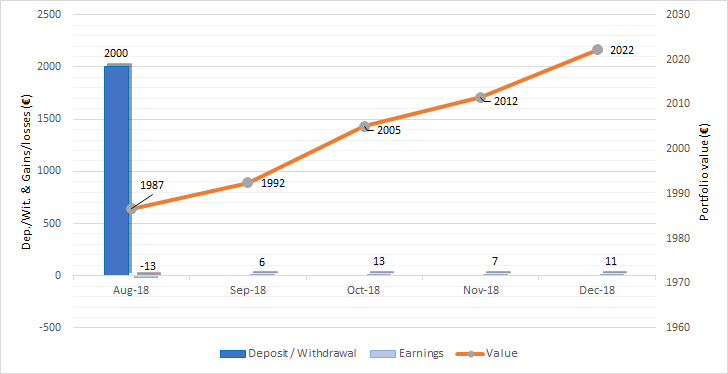 I am not comfortable with this margin, so I’m changing back to my previous auto-invest strategy; secured loans with A ratings, 12 months term and 8-10% average interest. From my own experience, I would recommend to any new crowdfunding investor to try a platform first depositing little money and waiting for a few months to get comfortable with it, learn how the platform operates and value whether it’s convinient for you or not before depositing more funds. Crowdestate is an excellent platform, but it just doesn’t seem to work out with my short term goals by now. I increased my Envestio balance by 1000€. As I imagined, newer opportunities offer lower returns than before, but they are still the top ones within my crowdfunding platforms. In addition, as I joined through a referral link I get a 2.5% bonus for 270 days in any deposited funds, which quite motivates to keep raising this account for that period. If you would also like to enjoy these benefits, you could do so by joining throgh my referral link. I will also get a bonus, but as I explain in my blog post “the reasons behind One Million” I plan to donate the 100% of it to the Bill & Melinda Gates foundation throughout 2019. I’ve got not much to talk about Fast Invest this month. I had the idea of adding more funds, but I didn’t have a convincing first touch with their customer service. Besides that, same average good returns as in December. This is the perfect platform for those that just want to add money somewhere and bother about absolutely nothing. Fast Invest reinvests your money like a clock. Not much to play within their platform. How are my 2019 goals going? → 428€ – Getting closer but not quite yet. → 0.8/12 – I can’t stop reading blogs instead! ‘My monthly savings rate is terrible, only 11%, basically it’s because it includes a period longer than 30 days. 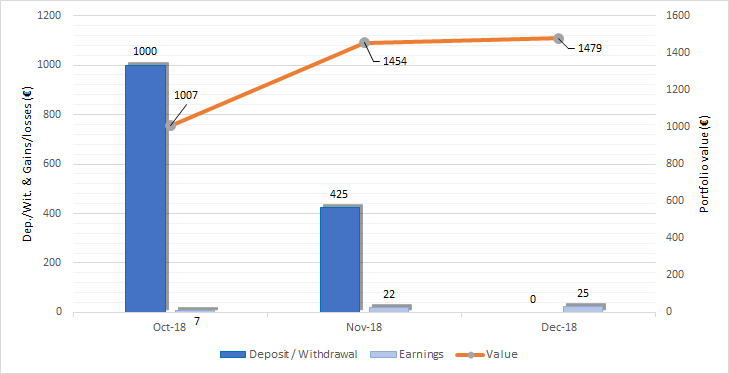 My December pay date was on 20th and got the next pay check on 31st of Janary, these sum up 42 days in total. We also moved recently to a new area and my girlfriend hasn’t found a job until now, so I had to take care of the monthly expenses. I think I quite managed at the end to be able to save at least something under these circumstances. 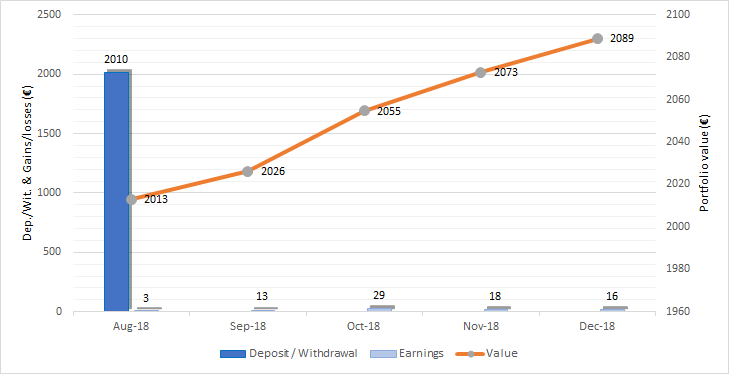 Next month I should be able to increase this saving ratio up to at least 30%, although I have some unexpected expenses like travelling to Spain to renew my passport and ID (just in case a possible hard Brexit would become as hard as Titanium). Thanks for reading my second portfolio update, hope you enjoy it as much as I did writing it (or should I say uploading pictures?). 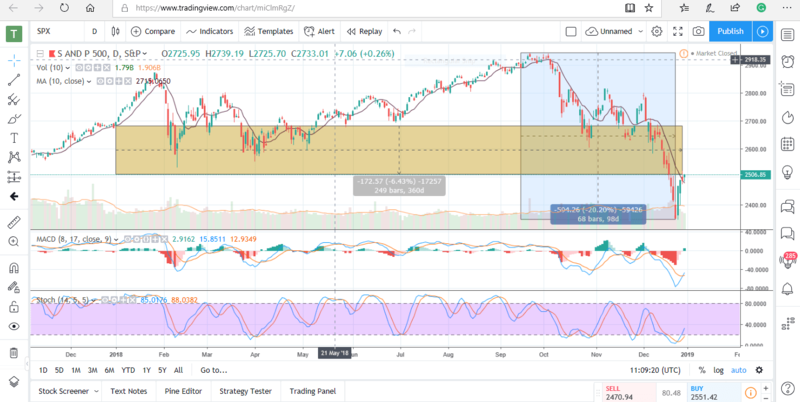 Where do you think the S&P 500 is heading in February? Up or down? Do you reckon 2019 will be a good years for stock markets?Let me know your thoughs in the comments down below. Damn, those Forex returns are really impressive! But I totally understand how worried you must have been, since you’re talking about such a large amount of money. I’m actually also playing around with some automated forex investing via a friend since mid January, but with much smaller amounts relative to my total portfolio value. Still, returns have been very good so far (+15%! ), so I can’t complain. With your high investment sum, I would personally probably withdraw half of the monthly gains and reinvest them in other assets (P2P & ETFs), just to ‘realize’ some of it and diversify risk over the long term. But I understand the FOMO connected to just letting everything compound with such high potential returns. Yes, returns in Forex trading can be quite high these days thanks to the unstable market outlook, which is good but also carries larger drawdown levels. Not everyone can deal with that, I do struggle sometimes althoug my risk tolerance is higher than average. That is probably what I will do, but at the moment I’m compounding until my account reaches 100K, from which amount the success fees are reduced from 25% to 20%. I used to track my investments the same way before starting with the blog, that’s why I have this long time record. The only difference is that now I post it online. I see it as a hobby I enjoy doing (as far as the numbers are green, hehe). The drawback is the time it takes to deal with WordPress sometimes, but I hope to get more used to it in the future. Thanks for your support Nick, I feel honoured when a blogger with more experience leaves a comment. Very impressive and diversified portfolio and great results Tony! Especially your passive income… I am so far from achieving that (mostly by choice as I dedicate most of my available monthly funds to my company’s ESPP program). Keep up the good work! Oh yes…what are you reading at the moment? Yep, my passive income is getting better cos I’m locating more funds to P2P. However, these are not free of tax and it can be a little misleading. I’m reading the Jonh C. Bogle’s book : “The little book of common sense investing” nearly finished it. I would highly recommend if you enjoy reading this stuff too. This is a great update! I really like how diversified your portfolio is, and am very impressed with your Algotech returns. Not sure I’d be able to cope with seeing such a large negative value at that one point though! Your savings rate is also pretty good considering the longer time frame and having to cover your girlfriend’s expenses. You’ve got a great blog. Looking forward to reading more. On a different note, I hope that some sort of deal regarding Brexit can be achieved so that you can be certain where your future in the UK stands! Many thanks Dr. Fire! I’m glad you liked it. It is diversified but it is also a quite demanding one if I want to keep control of how my investments are doing, quite enjoy it though! Yep, my January savings rate is good considering the facts I guess. It’s the first time I’ve ever calculated it, so I’ve got nothing to compare too at the moment. Thanks for your last kind words and support. I also hope that something can get sorted soon and forget about the word ‘Brexit’ once and for all, and begin with some sort of plan. You guys are great and so inspiring! You said last month that you were having problems withdrawing money from Algotechs. Have those problems with the Danish bank been overcome now? Thanks for the interesting update. I am afraid they are not yet. The last update is that their agents are getting closer to get a legal solution to unblock customer funds. Fascinating to read this Tony. It really brings home to me the risk-reward trade off. I stick with trackers and I have maybe £1,000 in peer to peer lending in an innovative finance ISA. That’s a no effort approach but reading through this shows the alternatives if I choose more risk and more effort. I’ve got a little more space to fill in my ISA before the end of the tax year so I may look at some of these in a bit more detail to see if I can fit them in somehow. Excatly, it all depends on how much extra time you want to spend to improve your returns. Good luck with filling up your ISA, and perharps adding a new investment? thanks for the update – keep up with the hard work! Hi IM and thank you for stopping by! True, Algotechs is experiecing some issues with withdrawals as their main bank has been on the bankruptcy edge. It is riskier to invest in companies that are not protected by any main financial authority than can protect your money in a case of default. Similar thing could actually happen with any not regulated platform (most of these from the East are not). 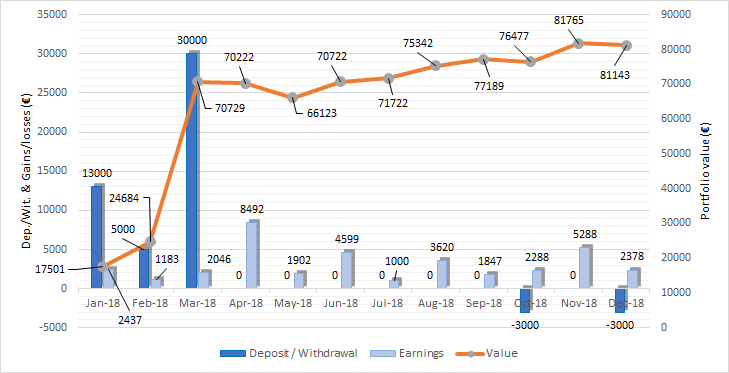 This withdrawals issues has obviously made investors very unhappy, posting negative reviews, and other competitors and “recover your funds scammers” have been adding some wood to the fire. For now, the only thing I know is that my money is still in my trading account and compounding nicely, how it will end up that’s another story, but still have some faith.